Q: How do I add Estimate Rocket to my device's home screen? A: Log in to estimaterocket.com on an iPhone or iPad. Then click the up arrow icon shown below and click the Add to Home Screen button. A: Log in to estimaterocket.com on an Android device. 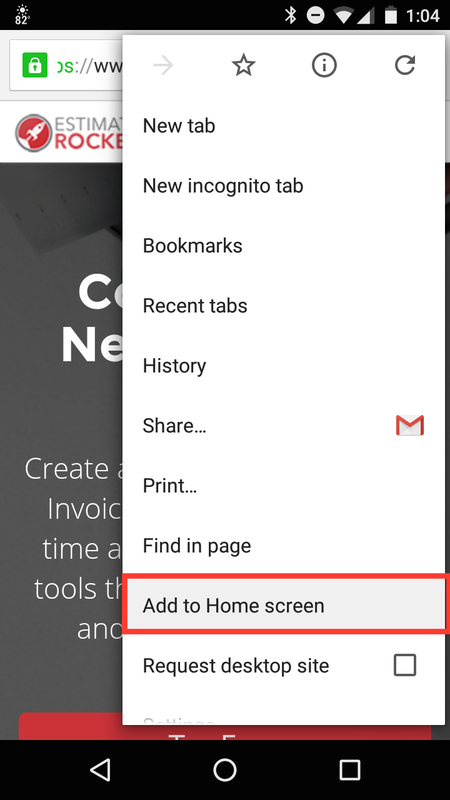 Then click the 3 vertical dots in the upper right corner of your browser and click Add to Home Screen. Q: How do I add another Employee? A: Click the Settings-Employees. Click +Employee to enter their Information, Responsibilities, and Permissions. You may also want to check out this page on Adding Employees and this page on Setting Privileges. Q: Can I re-arrange my Line Items & Groups? A: Yes! Move line items within a group by clicking the Drag and Drop button in the upper right corner of a Group. Then click and drag your Line Items or Groups. If you want to move a line item between groups, Edit the Line item (by clicking the yellow pencil next to it) and change the Group Name to the one you want the item in. Q: How do I apply a discount to a Completed Invoice? To show the discount on a document, add a line item with your discount description and enter a minus sign in the unit price field in front of your discount amount. If the customer is not going to pay the full amount, use Payments + and select Credit from the drop-down menu. Then, enter the amount that the customer is not going to pay as the Amount. Q: I want to change the word 'Estimate' to 'Proposal' in my documents. Is there a way to do that? Q: How do I know if a customer has approved a proposal in the customer portal? A: When a customer approves a proposal in the customer portal, an email notification is sent to the currently assigned user for that project as well as the project owner. You’ll also see a ‘Requires Attention’ notification in the right side panel of the Projects tab, letting you know which proposals have been customer-accepted. Q: If a client decides not to go with us, what should we do? A: Sometimes, a potential client may decide to hold off on a project or go with another company. In this situation, we recommend canceling the project and adding a tag to the project notes indicating why it’s closed. 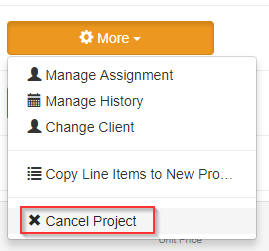 Open the project and click More in the Actions section, then select Cancel Project. Open the project and click the yellow edit button next to the project name, then add #closed-lost (or something similar) to the Internal Notes box. If the client decides later that they’d like to work with you, great! You can reactivate your project by opening it, clicking More, then selecting Reactivate Project. Q: Why can't I see my Estimate Rocket appointments in my Google Calendar? A: When events are added or edited in Estimate Rocket we update our calendar feed immediately, but Google Calendar only checks for updates periodically. Unfortunately, we have no control over how often Google Calendar checks for updates and we haven't found a way for users to force Google Calendar to check for updates. It seems like updates are usually picked up by Google Calendar within an hour. Q: What's a Follow Up Campaign? A: The Start Campaign button lets you initiate automated followup email campaign with your customers when the project reaches certain points. Check out this short video on Follow Up Campaigns, one of the best features of Estimate Rocket! You can also check out our help page on Followup Campaigns. Q: How do I change the default email template that pops up when I click Emails +? A: The default email template is based on the project state and the alphabetic sort order of the templates. In the Estimate state, the default template will be the first template alphabetically with Template Type = Estimate. So you may just need to change the Template Type to Estimate and/or change the template Name to sort first in the list. Q: I'm trying to send an email, why does it say Pending? A: Sometimes the receiving email servers will not immediately accept emails, so there can be a seemingly long delay before they get delivered which is when we get the report from the email service that its no longer pending. You may need to click the refresh button to update the status if you have not left the page. Q: Why are my emails being sent to my customer's Spam folder? A: There are many different reasons that emails go to spam or junk folders. Most are caused by settings on the client's email programs. The best defense is to follow up the email that has the Estimate attached with an email that has no attachments just to confirm that they received the Estimate. An email with no attachments has the highest probability of success. You should also let your clients know that you will be emailing them and the estimate will come from the EstimateRocket.net domain. A: We don't currently have a referral program, but we would really appreciate it if you decide to recommend Estimate Rocket to others if you think it would help their businesses. Q: Can I cancel my subscription during the off-season? A: At Estimate Rocket, we pay year-round to store and protect your data so it's available to you when you need it. Because of this, it's necessary to charge your account even during the off-season. Otherwise, you'd need to re-create your account from scratch each new year.